Korean researchers have developed a super capacitor battery with double the capacity and ten times faster charge speed than conventional batteries by controlling two dimensional nanomaterial structure and composition. The technology is widely expected to facilitate the development of ultra super capacitor material utilized in next generation energy industry such as electric vehicles and smart grids. The electric double layer capacitors (EDLC) boasts high power output, faster recharge and discharge, and semi-permanent battery life. However, low energy density can restrict the application. EDLC is a type of super capacitor that stores or discharges energy within seconds by absorbing ion electrically pulled from the electrode surface. 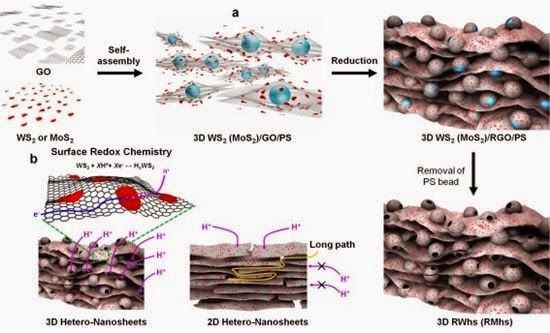 A series of research has been conducted in advanced countries including the US to enhance the energy density by developing super capacitor electrode material. The research team found secondary nanosheet by chemically exfoliating the bulk layered compound made of transitional metal and sulfur as they would to retrieve graphene shedding off a layer of graphite before they build the two dimensional nanosheet into a three dimensional structure.